The aim of Design for Reliability (DFR) is to design for zero failures of critical system functions, which results in enormous savings in life cycle costs for producers and users. 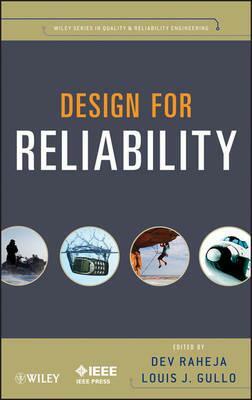 This practical guide helps readers to understand the best-of-breed methods, technologies, and tools for incorporating reliability into the complex systems design process. A significant feature of the book is the integration of ideas from computer science and market engineering. By adopting these design principles and learning from "insight" panels, engineers and managers will improve their ability to compete in global markets. DEV RAHEJA is President of Raheja Consulting, Inc. For over thirty years, he has served clients in numerous industries, including aerospace, medical devices, auto, and consumer products. Raheja is also the coauthor of Assurance Technologies Principles and Practices, Second Edition (Wiley). LOUIS J. GULLO is Senior Principal Systems Engineer at Raytheon Missile Systems in Tucson, Arizona. A retired U.S. Army Lieutenant Colonel, Gullo has more than thirty years' experience in military, space, and commercial programs. He is a Senior Member of the IEEE and Chair of the IEEE Reliability Society Standards Committee.